Artifice and Jim are agents for Prince Albert’s secret commission. Condemned criminals, they have been risen from the grave with a combination of dark magic and esoteric science to be the crown’s agents in fighting criminal dark magic that threatens the city. Someone is raising the dead and their creations are causing chaos and death throughout London. The two agents must track them down and stop them – and along the way, new agent Artifice learns about her history and what she has become – and realises she has a lot more questions than answers. 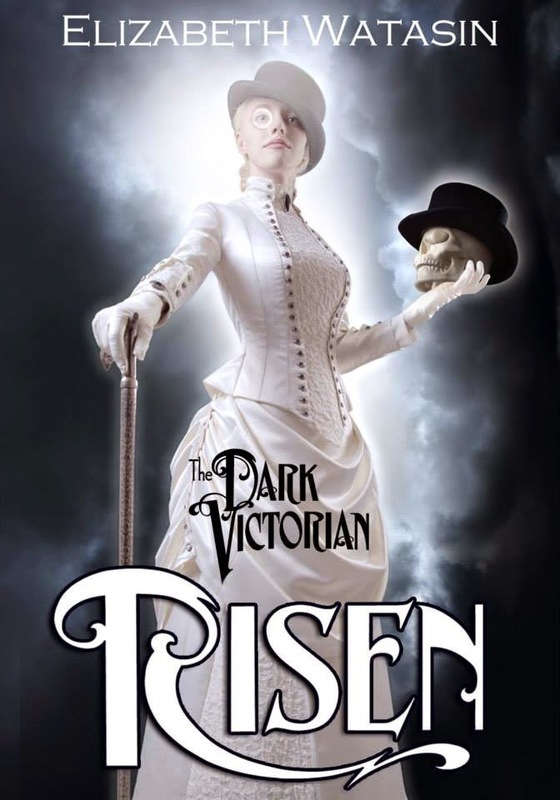 We have a steampunk Victorian setting where magic is commonplace – all kinds of magic but in particular England has been plagued by lots of dark magic from illicit practitioners getting up to all kinds of naughty shenanigans (and killing lots of people) until something had to be done. And that something was the powers that be creating their own undead agents from condemned criminals. Enter our characters – brand new agent Art (Artifice, a ghost) and the much more experienced agent Jim Dastard (a skull. A talking skull). This is definitely a unique cast right there. And they have a really fascinating dynamic – Jim is really experienced and knowledgeable, he is Art’s guide to London, magic and the whole world around her; he has all this insight. But he’s also a skull. Providing knowledge is pretty much the entirety of what he can do – he provides knowledge but he is entirely reliant on Art to actually physically act. And Art has had her memory wiped as part of the resurrection process – but she knows she’s a Quaker (which is a fascinating and rare viewpoint in and of itself). But she knows, by merit of her being undead, she must have committed a capital crime (or have been executed anyway) which brings in lots of guilt and worry. There’s the whole complexity of her having to relearn the world around her, having all these memories but no context to connect them to an knowing absolutely nothing about herself – knowing more about the places around her than her own history. Then there’s added conflict with her having to go out and be focused on the mission, not her charitable impulses and even having to fight, hurt and perhaps kill people as part of her job which conflicts massively with her Quaker morality. But she has to be the one to act – because Jim can’t and she’s so physically capable (she’s extremely strong). There’s a whole lot of depth there and it’s all touched on with a delicate hand. It doesn’t consume the story but it’s all there, it’s wonderfully well done. Their presence in society is also fascinating: because they are, in some ways, the thing that stands between the general populace and all kinds of evil machinations, almost hero figures. But they’re also police which makes people from vulnerable classes suspicious, and they’re undead and they’re former condemned criminals. There’s a lot of nuance there. Art is also very unique in different ways. Physically she is very large and muscular, which is made very clear which doesn’t fit the common depiction of womanhood around her. But she’s not presented as less female or womanly because of it – nor is it linked to her being attracted to women. In fact, when Jim refers to her as “unsexed” because she doesn’t act in a “ladylike” fashion there’s a wonderful retort that it may not be “ladylike” but women do fight and are active – skewering this idea of the proper, delicate womanhood. And yes, she’s a lesbian or bisexual – and it’s artfully presented in the story with an excellent combination of the prejudice of the time being made clear while at the same time Art being confident in who she is an not feeling any shame or judgement for it. In addition there are other lesbian and bisexual female side characters. The book also has some nice examinations of class that are appropriate for the setting – the poor, the over worked, the exploited are all presented in this book not overwhelmingly but as a constant undercurrent. It particularly addresses industry and how it often grinds people – especially children – under the machines for the sake of efficiency and profit and draws an equivalency from that to actual murder because there’s not a lot of moral difference between it. On the downside there are no POC – at least none I remember – and it’s a large number of side characters, minor characters and bit characters. There’s this terrible idea that Victorian London was all white and we see this a lot in steampunks or Victorian gothic and it’s grossly inaccurate. I think the plot was perfect for this book – because it wasn’t overly complex. There was a twist, don’t get me wrong, it’s not entirely linear, but nor is it overly convoluted or difficult to follow. It was well paced, it moved along and it was beautifully written and kept me engaged every step of the way – but it was a nice, simple, direct plot. This is exactly what was needed. The world building is so elaborate and involved, the characters so new and even kind of alien and the whole setting so different from what you can see elsewhere that I think you’d be lost with a more complex plot line. We needed a simple backdrop so we can be fully immersed into this world and these characters – too much complexity would make this whole book so very overwhelming because it is so rich. There are hints of more richness to the world as well – but they are just hints just as there is a suggestion of future plots but, again, they’re hints and not even a prologue. It’s wonderfully restrained and suggests so much that I want to just dive into but doesn’t overwhelm us with it all. This is especially important because the writing is beautifully rich and ornate which is really evocative of the Victoriana of it without being dreadfully long winded. It hits that perfect balance that is so hard to get right. This book was original, had a fascinating concept, an excellent plot and some characters I absolutely love. As a stand alone book, this is definitely worth reading. But the good news is it isn’t a stand alone book – it’s the first book of a series. Which means this excellent introduction is just the beginning of this excellent world and I cannot wait for more.